The Atlantics Band consists of some of the most talented musicians and vocalists to hit the scene in a decade. Take all the talents, mix in some Oldies, Jazz, Pop, Latin, R&B, Funk, Rock, and Swing, and The Atlantics Band has the complete entertainment package to make your musical event the one everyone will be talking about. Let us entertain YOU! Listed by "Modern Bride" magazine as one of the TOP 150 BANDS in the USA. 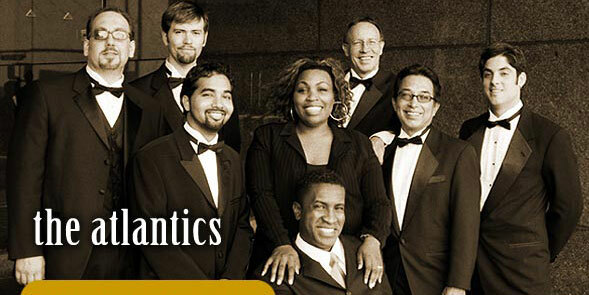 The Atlantics Band is a favorite in Dallas, Austin, San Antonio and Houston. "I can't begin to tell you how amazing this band is! They played at my reception for my wedding on June 11 in Houston, TX. They were freaking PHENOMENAL! They were so fun and energetic and really looked like they were enjoying what they were doing! They were super interactive with our wedding crowd as well! We loved it! They had my entire wedding party and all guests out on the dance floor! It was the best night of my life! They played all of the good jams that you want to hear at a wedding, plus they took special requestes that I gave them before hand. This band is absolutely amazing! I know I've said that about 100 times, but I can't stress the fact enough! I wish I could go back to that night all the time! It was so fun! The Atlantics definitely made my reception! It would not have been as big of a success without them! I definitely reccomend everyone to use them for any event/special occasion! You will not be dissapointed! Thank you, Atlantics, for such an amazing night! You made it one I will never forget! 5 stars for you!" "Hi Mike, You and your band blew all of us away Saturday evening. I always knew that a good band made a good party but you were a fabulous band and you made our wedding celebration a most incredible and magical evening. I never saw so many people jump to their feet to dance as I did at our daughter's wedding and this was all thanks to you. Your versatility was phenominal not to mention having two fabulous lead singers and so many other talented musicians. I could go on and on but suffice to say....you were better than we ever dreamed a wedding band could be! Our frienda and family are still talking about you and your band and we are too!" "I just wanted to tell you that The Atlantics are awesome. I had the pleasure of enjoying them at my company Christmas party on Friday night (PBS&J) here in Austin. It rocked!!!! I am actually newly engaged and wanted to inquire about the band performing at my wedding. Again...we could not stop talking about the band all day today!" "Mike, Just wanted to let you and the band know that the Fulbright party was a huge success thanks to you! I got a great review on Monday morning....they were thrilled, and said they will definitely book you again. Thanks so much for your professionalism, and making my client so happy. I truly do appreciate it! Happy Holidays!" "As the on-site wedding coordinator, the band was well-received ... the dance floor was always filled! From an event standpoint, they were very nice to work with... load-in was on-time, announcements were made correctly and on-time. As far as I know, HCC was pleased with them, logistically, as well." " John and I wanted to take this opportunity to let you know just how much we enjoyed working with you on Sunday evening for the Pugh and Rosen wedding at the Derek Hotel. I have heard so many wonderful things from other consultants in Austin about you and was thrilled with the opportunity to work with you and hear you in person. From the moment you and your band took the stage until the last dance , no one ever left the dance floor. The couple was so pleased that their guests had such a fun evening. As a consultant we work with bands for most every wedding and I cannot tell you how easy you were to coordinate with to make the evening go smooth and seamless. Thank you for being a part of making Rachel and Kyles wedding a memorable moment. We are looking forward to referring your band to future brides." "My friend and I saw you guys for the first time in Austin last night. We had the best time and were so impressed with your performance. You are each so very talented with special gifts and fit together perfectly. Keep playing and Stay Together. May all your dreams come true!" "Just wanted to personally thank you and the band for the great sound last Saturday night in Fort Worth....this was not a boring wedding reception! We enjoyed hearing and dancing to the song selections from your list. There was quite a Houston contingent at this wedding.. Please feel free to use us as a reference anytime." "The solo's and the horns were great....tight band! I can't thank you enough for the wonderful entertainment at our wedding on Saturday night. Matt and I loved every minute on the dance floor! All of our friends and family are raving about the awesome band! We also appreciate your stretching the party out a little longer. It was well worth it! I have never danced so much in my life. Thank you for making it so much fun for everyone!!!" "I just wanted to say how fun Saturday was from everyone's point of view. I just talked to the mother of the bride and she was soo happy, she said she didn't worry about anything all night and you were just GREAT! Cindy (the bride) told me a million times how fun it was. And obviously I had fun :) So thank you. thank you. You make me look so smart :)"
"Now that things have settled down a bit since the wedding, I wanted to take the time and thank you for making our wedding fabulous. During the day things were a little stressful with relocating the reception and the hairdresser not showing up. Fortunately for us, the Atlantics were the rock. There are so many things I need to thank you for, but being on time, easy to work with, and flexible are the three most important things a bride and her family are most concerned with the day of a wedding and the Atlantics performed them flawlessly. When Andrew and I arrived to the reception and got to start the party off by dancing to "This will be an Everlasting Love" by Natalie Cole, I knew we were in for a long and fun night. Everything you performed was fantastic, memorable and most important fun! Singing on stage with my friends and Courtney and dancing with Rod were definite highlights. My friends and family are still complaining about how sore their feet are from dancing so much. I've had numerous requests for your information so that my friends can book you for their events. I don't think I'll ever be able to express how grateful Andrew, my parents and I are for making the wedding reception a huge success. I hope one day I get to work with you again. I've also attached a picture of me singing at the reception, I'm sure you will want to sign me to your band one day (haha)!" "Your performance last Saturday night was nothing short of spectactular. Courtney's moving rendition of "At Last" during the bride and groom dance was mesmorizing and a beautiful start for an exciting and fun-filled evening. I don't think the dance floor was ever empty and our guests can't stop raving about the fantastic time they had because of "our wonderful band." Thank you for everything and consider me a life-long fan!" "I just want to thank you so much for being a part of our wedding day. I can't even tell you how many compliments I have received on the band. I have even had people call and ask for information about you for weddings and other events. My husband is not someone you would normally find on the dance floor and it was hard to get him to leave when you all were playing! That really made the night for me!! :) We were actually wishing we could stay longer. My sister-in-law is getting married April 5th in Houston, Texas. Do you know if you are available that date and also your prices (including any traveling expense). Thank you! Thanks again for helping make our wedding day so special. I really appreciate everything and please tell the band members thank you from me as well." "We absolutely had a wonderful, very fun wedding and so many people have commented on how great the band was. My bride and I spent the last hour (at least) on the dance floor with our family and friends, as we had hoped to do (and have the wedding video to prove it--how embarassing...). Thanks again--I hope you had a great holiday season!!! Of course, please feel free to forward my thanks to the Atlantics manager for putting on such a fun show." "You are awesome! It was terrific and you all made the party, in my opinion. Everyone sure had a great time. You are such a delight to work with - your vocals are outstanding. Thanks for everything Mike and please stay in touch. I obviously will continue to refer to you. Happy you all got home safe and sound."